Transparent cassette with stick on labels with a Chop 'Em Out typed sleeve. This test pressing tape was made on the 6th August 1992, almost two months before the release of the album. 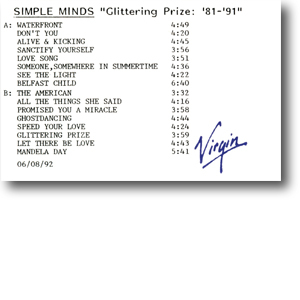 The title suggests the album was going to be called Glittering Prize 81/91 . This different title was repeated on both the cover and the spine so was unlikely to be a typo. Hardly any post-production tapes from Chop 'Em Out ever surface, making this cassette extremely rare.